In preparation for the Summer Olympics taking place in London, the Olympic spirit shined through on Thursday, July 19 at the annual Larry White Junior Regatta, held at the Niantic Bay Yacht Club in Niantic, CT. This regatta is one of several held throughout the country as part of US Sailing’s Junior Olympic Sailing Festival. 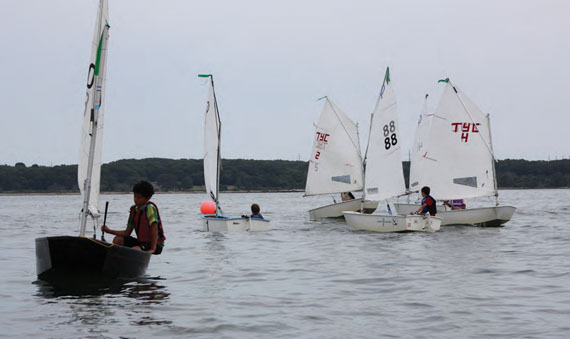 An instrumental advocate and contributor to junior sailing, Larry White is responsible for the growth of high school sailing throughout the USA, including starting our own local sailing team at East Lyme High School. For his efforts, White was awarded US Sailing’s most prestigious award, the Nathanael G. Herreshoff Trophy, in 2005. White also held many roles as a US Sailing volunteer, serving many positions on the committee and is most known for his successful 15-year presidency of the Interscholastic Sailing Association. We were honored to be in his presence as he draped Olympic medals from the necks of our young sailors. The yacht club was buzzing with excitement early in the morning as eager sailors arrived to register with US Sailing in order to compete. They quickly gathered their gear and headed out to the beach and boatyard to prepare for a day on the bay. It was nice to see seamanship on and off the water by all competitors. Members, parents, volunteers, coaches and sailors pitched in to help our young Olympic competitors rig. Then it was game time. Once on the water, sailors were ready for the competition as were greeted by a northerly breeze. Courses were set, sailors sized up their competition, and coaches delivered their last bit of advice. With 104 sailors in 79 boats on the water, and almost 70 volunteers, getting 18 total races off looked so easy! The sun broke through the clouds around lunchtime and the breeze began to taper off, trying to pull around and fill in from the south. Love for the sport was evident as many of our competitors stuck out the day through shifts and lulls. Although the fluky wind never quite filled in enough for sailors to buzz around the course with ease, each fleet got in a good number of races with Lasers, Laser Radials and 420s completing four races. Spinnakers of all colors were flown in the 25-boat 420 division and could be seen from the local beaches. With 35 boats on the line, our Red, White, and Blue Optimist fleets were also able to complete four races. The competition was steep and the taste for an Olympic Medal was in reach for many of our competitors. Our youngest and newest- to-competition division, the Green Fleet Optis, completed the most races for the day with six. Kudos to our young racers. As sailors came in after a long day on the water, they were greeted by the smell of burgers and hot dogs cooking on the grill and refreshed by ice-cold sodas. Good sportsmanship was not in question as sailors helped each other dock, de-rig, and clean their boats. As boats were put away and sailors began to relax, the Olympic theme song flooded the beach. Sailors took their place around the Olympic podium as they awaited the day’s results, eager to see their co-competitors receive their Olympic Medals. Our winners stood proudly to a round of applause atop the podium where they embraced the honor of having an Olympic Medal placed on them by Larry White. Rebecca Auperin is the Head Instructor at Niantic Bay Yacht Club in Niantic, CT.